Comet 3D/Biela was a periodic comet on a 6.6 year orbit that was tracked sporadically starting in 1772 until 1852. The defunct comet (That’s the “D” in the designation) bears the name of Austrian astronomer Wilhelm Biela, who first suggested that successive apparitions of the comet where one in the same in 1826. The orbit of defunct comet Biela. Credit: NASA/JPL. Clearly, Comet Biela was in trouble. During its 1846 appearance, surprised observers noted that it had split in two; after 1852, it failed to show up entirely. The remains of the comet did, however, go on to produce spectacular meteor storms in early December about once every seven years through the end of the 19th century, storms that tapered off as the calendar flipped over to 1900 and beyond. The 1846 breakup of Biela’s Comet. Credit: Bilderatlas der Sternenwelt. 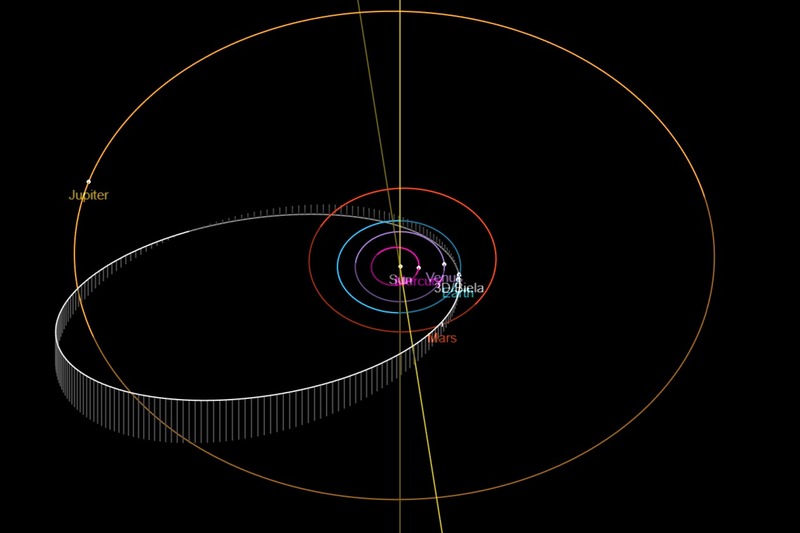 Interestingly, the Near-Earth Asteroid Tracking program (NEAT) turned up a small periodic comet in 2001. one whose orbit beared a rough resemblance to the long dead comet Biela. A coincidence, or a solitary surviving fragment, perhaps? Many historical sources actually cite the first photographic image of a meteor as an Andromedid taken by astronomer Ladislaus Weinek on November 27th, 1885, though apparently, the actual image, if it still exists, has yet to make its way onto ye ole web. The Andromedids fell into obscurity through most of the 20th century, until 2011 when Canadian Meteor Orbit Radar observers noticed strong returns. Robert Lunsford notes of the American Meteor Society website that the Earth was near a debris stream laid down by Comet Biela in 1649, and the 2011 Andromedids produced a respectable though below storm level rate of 50 meteors per hour. The radiant position for the Andromedid meteor shower. Credit: The American Meteor Society. Prospects for the 2018 Andromedids – And we may approach this same 1649 stream again seven years later, in 2018. Typically, the Andromedids are active and rise above the sporadic background rate from November 30 to December 10th, peaking on December 3rd. This year, the peak is expected to arrive on the evening of December 5th/6th, favoring mid-northern latitudes. The Andromedids are swift-moving meteors, striking the Earth at 19 kilometers per second. For mid-latitude northern hemisphere observers, the radiant for the Andromedids is already high to the east at sunset in early December, and transits near local midnight. The Moon reaches New phase on December 7th, another plus for an Andromedid vigil. We’ve already seen a few early evening Andromedid meteors, and this coming weekend is an ideal time to keep an eye out for any heightened activity from the shower. Note that there’s also an even better shot at a ZHR approaching 200 for the December 2nd, 2023 return of the Andromedids seven years from now… if the trend continues, this obscure shower may make its way back on the annual roundups of must see meteor showers. Observing a meteor shower is as simple as stepping out and counting what you see, no gear required. Imaging meteors is also pretty straightforward: you can simply aim a tripod-mounted DSLR camera skyward with a wide angle lens, take a series of time exposure shots 30 seconds to several minutes long, and see what turns up. Finally, don’t forget to report what you see to the American Meteor Society and/or the International Meteor Organization. December also features the Geminids (peaking on December 14th) and the Ursids peaking right before Christmas on December 22nd. But sure to keep an eye out for the Andromedids this weekend, as the ghosts of comet Biela slide silently through the winter sky. Read about observing and photographing meteor showers in our new book, The Universe Today Ultimate Guide to Observing the Cosmos – on sale now. How far south can one probably observe this? Thanks… the radiant is pretty far north at declination +50 degrees… I’d say the entire northern hemisphere down to about latitude -10 degrees south has a shot… seems that the northern hemisphere has all of the major meteor shower radiants.